Lanna Dhamma alphabet was used mainly for religious communication in the ancient Lanna Kingdom of Thailand. The old manuscripts using this alphabet are gradually decayed. It is desirable to preserve these valuable manuscripts in machine-encoded text files. Existing works used optical character recognition (OCR) methods based on wavelet transform for recognition of handwritten Lanna Dhamma characters. However, the test accuracy of writer-independent recognition is not satisfactory. This work proposes an OCR method, called LDIMS, for recognition of handwritten Lanna Dhamma characters using a set of optimally designed moment features. The LDIMS using an optimization approach to feature selection consists of three main phases: (1) determination of moment orders for each of eight effective moment descriptors, (2) the best combination of selected moment descriptors and (3) the optimized selection of moment features using an inheritable bi-objective genetic algorithm. The LDIMS has three individual feature sets for the recognition of handwritten Lanna Dhamma characters in upper, middle and lower levels. The character images gleaned from previous work were used as a training dataset. A new character image dataset from different writers was established for evaluating ability of writer-independent recognition. The experimental results show that the LDIMS using four moment descriptors, Meixner, Charlier, Tchebichef and Hahn, has test accuracies of 86.60, 74.38 and 85.82% for the characters in upper, middle and lower levels, respectively. The LDIMS with a mean accuracy of 82.27% performed well in recognizing the handwritten Lanna Dhamma characters from new writers, compared to existing methods using generic descriptors in terms of both accuracy and feature number used. 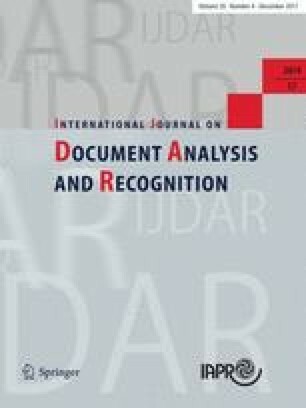 Experimental results show that the generalized OCR method, LDIMS, is also effective for character recognition of digit and English alphabets, compared to existing methods. The online version of this article (doi: 10.1007/s10032-017-0290-x) contains supplementary material, which is available to authorized users. This study was funded under the Royal Golden Jubilee Ph.D. Program by the Thailand Research Fund (Grant No. PHD/0185/2556). We would like to thank Chiang Mai University, Thailand, for financial support and collection of digital Lanna archives. We also thank National Chiao Tung University, Taiwan, for supporting this work in the Intelligent Computing Laboratory.